Discussion in 'POTW Collaboration' started by Serebii, Jan 20, 2019. Background Information - From Green (Blue in Japan) to Lusamine, Clefable and Clefairy! Established as one of the most important Pokemon in Pokemon history. Clefable is the fairy-type everyone loves to hate but everyone wants to play. What's interesting is that Clefable has long been an important part of Pokemon history. It's pre-evolution Clefairy was originally supposed to be the mascot of the Pokemon franchise and it sort of did in the Pocket Monsters manga. Clefable later served as an important and vital team member of Green (Blue in Japan) in Pokemon Adventures proving to be one of the most instrumental team members of one of the Pokemon's series earliest and most important female protagonists during a time where Green was scrapped from Pokemon Red and Blue. 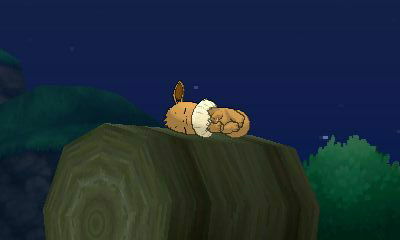 Luckily, Clefable returned to Green's side as one of her most important team members in the Pokemon Let's Go series, a subtle reference to the Pokemon Adventures long history with the character. 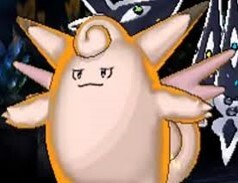 However some people may remember Clefable as one of the most annoyingly tough Pokemon of Lusamine's Pokemon team which served as a lead tank and proved to be surprisingly strong to even some of the veteran players in the single-player story. I guess it goes to show that single-player or competitive, Clefairy is just that good of a tank. Pretty basic set. The bane of a lot of Pokemon's existence who just love to setup such as Scizor. Other than switching Moon Blast for Dazzling Gleam and Wish for Moonlight in Doubles, that's really it. Same old tanky Clefairy. Thanks to Clefable's Magic Guard ability, it negates the effects of Life Orb's self-damage cost allowing Clefable to become a potentially dangerous special attacker with less drawbacks including any kind of damage that isn't direct such as Toxic. Psyshock is also a potentially good move against Poison-types and Moonlight is a quicker way of healing in Doubles than Wish. Other than that. The set is pretty straightforward. Attack and Heal, start over. For those who are familiar with the Pocket Monsters manga featuring a talking Clefairy... he's definitely... pretty special in a way and to increase Clefable's annoying powers of cartooniness, it's only fair to give him just an annoyingly equal set that will the annoy the heck out of Pokemon fans when they underestimate Red's talking Clefairy. You know what would be pretty funny. If they gave Clefairy the move chatter as a subtle easter egg to Pocket Monsters Clefairy. As you can see here, this Clefairy is the classic Follow Me set which is meant to use in doubles and this alone sets it apart from Eviolite Chansey. This would also be pretty decent in trick room teams. Seismic Toss also gives off decent damage and has more PP than Moon Blast while Icy Wind does weak damage but makes up for it by lowering speed, although would probably be disadvantageous during Trick Room. Also support Clefairy also has access to Heal Pulse and Cosmic Power for extra buffness to Clefairy or healing to teammates. Other than that, it's basically Follow Me Chansey which is the perfect annoying set for Red's Cartoonish Clefairy. 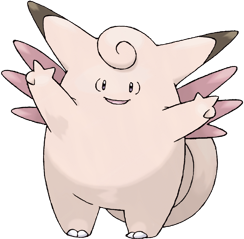 Clefable is one of the few Pokemon to make Stored Power into a viably-competitive move, as most as possible anyway. It's pretty simply Cosmic Power or Calm Mind... or both actually if you want. I have seen people use both and it can be annoyingly effective. One may want to have Flamethrower as a counter against Steel-types of course and Moonlight as recovery. Other than that, much of Clefable's playstyle is pretty much the same. Can I just say that it's kind of lame that we haven't had doubles coverage in the PotW section since Zapdos? This is getting kind of long, and pokémon that are better suited for doubles like Clefairy this week, or Shuckle, or Groudon (which is mostly viable for VGC which is doubles), or Vikavolt for Trick Room, or Charjabug (I'll admit it's gimmicky but it's far from unusable), they just don't get the coverage in their week that they deserve. At least in my opinion. Vikavolt only got one set this week in the article, and it was a set copied from smogon rather than from these forums. I understand that this isn't the place for this discussion, but wouldn't it be better to find some more writers if you are so short? With this little doubles coverage in the articles, it makes me wonder what the point is of even writing them here in the first place? We don't even know if there will even be a doubles section at all in the article. Honestly I think they should at least explain themselves why it's been like this for a while so we don't keep our expectations high. I think we'd understand since they do this for no pay and all. Personally I'm just doing it for fun even though I know that everything I wrote probably won't be up there. Clefable is one of very few Pokemon that can learn Soft-Boiled, which is more reliable than Moonlight, although it isn't compartible with Unaware due to Clefairy having to originate from a Generation III game.